Holy Beggars is an uneven book about uneven people – primarily the author, Arye Coopersmith, and Shlomo Carlebach – in a strange and unique place and time, Haight-Ashbury of the late ‘60s, specifically the House of Love and Prayer. The unevenness has the herky-jerky quality of a hand-held camera trying to track elusive characters and a fleeting zeitgeist. While there is credit given to editors, there is none of the polish of “as told to” a professional writer. The book awkardly shifts focus between past and present, different cities and stages of life, and many of the basic facts of Shlomo and the House are introduced along the way, in context, making it hard to plunge into. Little is told of the author's background, but he winds up as the “go to guy” in the physical establishment and the spiritual teaching at the House. With little religious background, but with a lot of flower power, he embarks on this task, with Shlomo’s initial enthusiasm, but limited follow-through. Although the House has an energetics start and burns brightly, the experiment is bound to fail.The failures, both of the House and the personal lives of those drawn to it, are presented in a painfully honest way. AC is disappointed by Shlomo’s inability to commit, or more accurately his tendency to casually over-commit, and his inability to just show up on time. 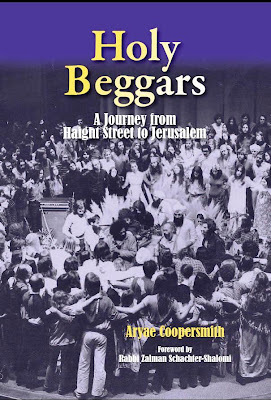 The marriages of Arye Coopersmith, Shlomo, and Zalman all fail, and their personal failures give a sense of their difficulty to partake of “Yeshuvo Shel Olom”, conventional settling of the world, and of unfulfilled spiritual seeking.Among the highlights of the book are Shlomo’s encounters with many other Eastern spiritual teachers. This was Shlomo B’Mochin D’Gadlin, without Tzimtzum of having to cover his Orthodox flank. Also included is his long relationship with Zalman Schechter, including Shlomo’s assessment of their commonality and differences. 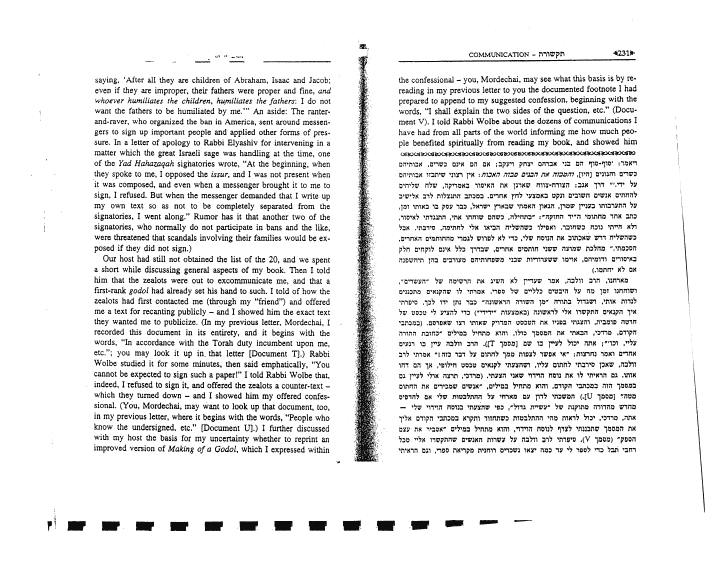 There are especially poignant sections devoted to the author’s re-connecting with many Orthodox people in Jerusalem, who were initially drawn in and taught by the author, but left for Israel for destinations such as Breslov and Diaspora Yeshiva, and far surpassed the author in Orthodox commitment. There’s not much of Shlomo's Torah brought down, but that’s not what you want to know about; what you really want are details about Shlomo’s private life. Fear not, they are discussed in detail, objectively, fairly, and in context. 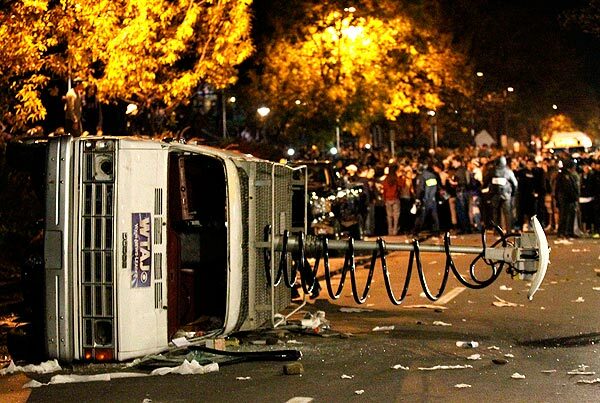 Much is made of the schism in the Berkeley Aquarian New Age Minyan, as fallout from pro and anti-Shlomo factions. For those of us who did not directly participate in the magic of that time and place, and met Shlomo afterwards, this book serves as a taste, a ta’am, of wide-open possibilities and inevitable crashes. While we may think that going from Lakewood to Brisk, or from Spinka to Lubavitch, is a life-altering transition, these seekers went to the outer edge of the known universe and back in their spiritual journeys; and yes, there was sincerity and manipulation Be’Ir’Vuvyeh. 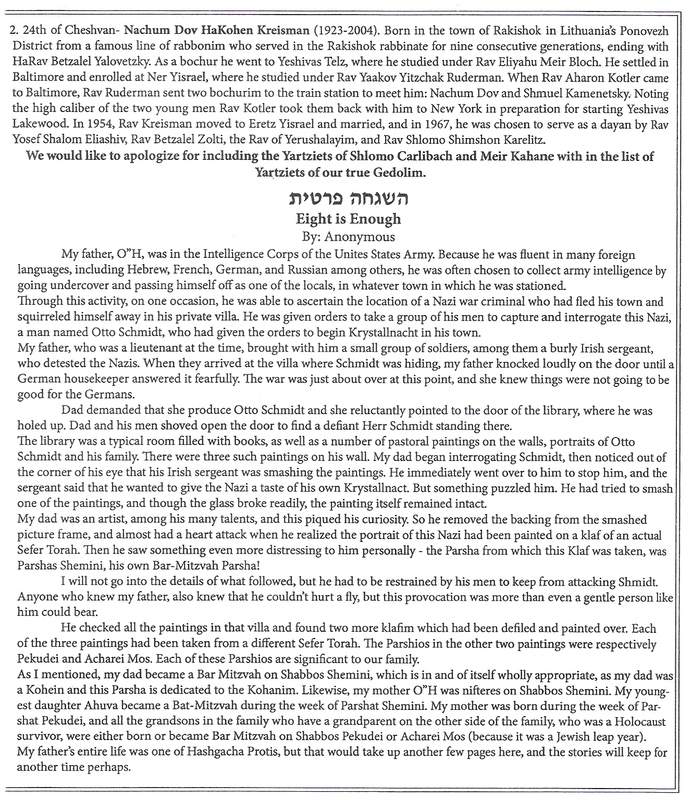 Last week we published A letter from Reb Shulem Foygel, Gabbai of the previous Belzer Rov, zt"l, to the latter's niece, the Rebbetzin Traneh Twersky of ניו סקווירא. 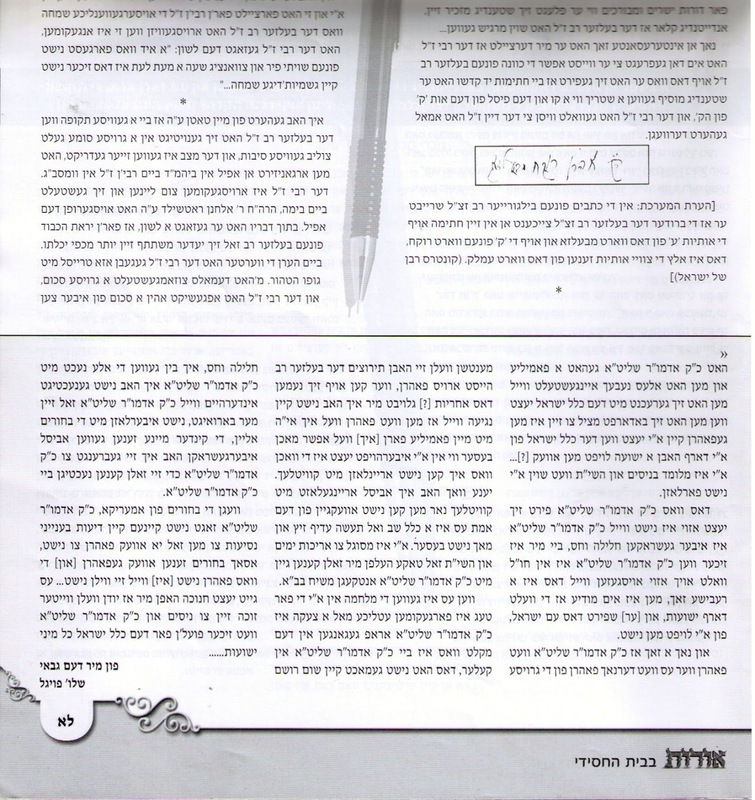 The letter was chock full of Chassidishe GEFIELEN and derheren, In other words how a Chossid looks at a Tzaddik such as the BR, and especially how one looks at the said Tzaddik and Rebbe at a time of war, such as was the case in 1956. Many of my English-only speaking brethren felt left out and voiced those feelings to me in e-mails and via Google Talk. מה עשה הקב"ה? despite the fact that I did not have the time to do it myself, we did have a volunteer who took upon himself the monumental task of translating Foygel's letter, no easy task. 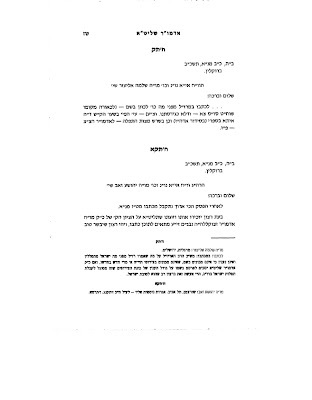 Many of our Satmar brethren didn't take very well to the letter, and some voiced their very strong opinions about it in the comments section. 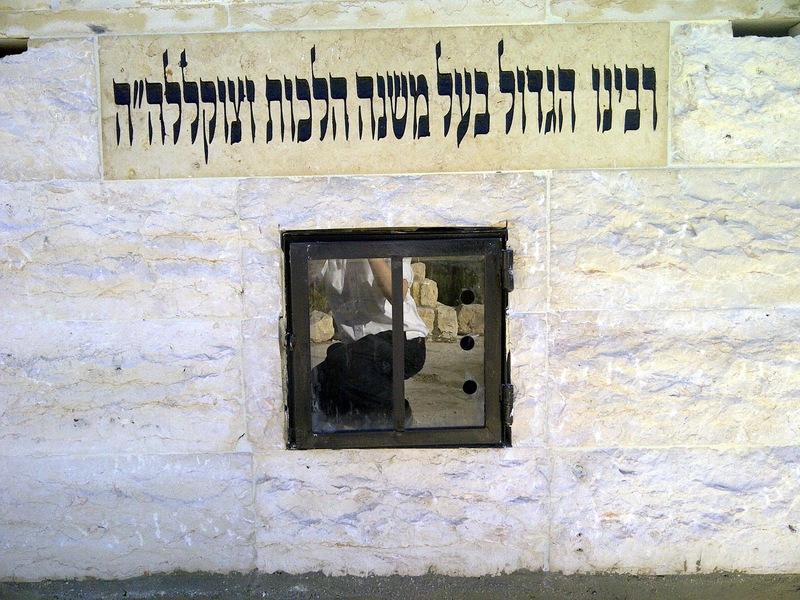 What bothered them was what RSF saw as "Rebbishe Inyonim," they saw as a lack of "leadership skills," something they say that their Rebbe possessed very strongly. There was more, but there's no need to repeat all their heretical thoughts here. 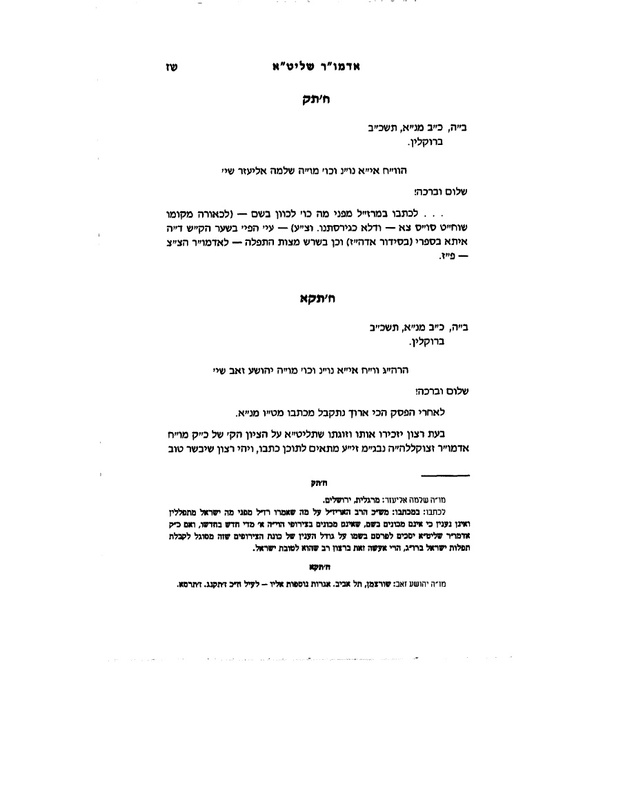 So now, without further ado, I present to you a free translation, somewhat literal, of the letter to Rebbetzin Twersky. We thank Mr. Ende Tsadik for his hard work. After greetings of peace and well being I hereby write to you that boruch Hashem all is in order with her uncle the Graceful Holiness (GH) the Admor Shlita and he is boruch Hashem well. 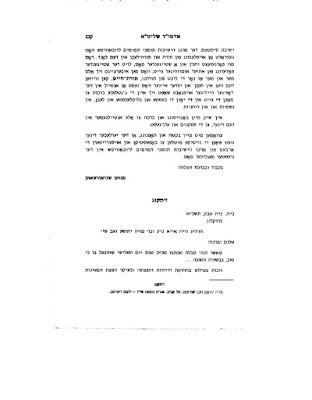 The widespread reports that the GH the Admor Shlita did not lead any tishn on Shabbos Kodesh are rebbishe matters; no one can do anything about it. Although I have been with the GH the Admor Shlita for a long time and I have seen similar conduct before, now it is different. Now it happens for longer periods and it has never happened that he should not lead the Shabbos meals. It is all due to the times and not because, G-d forbid, the GH the Admor Shlita is in fear. I can only share with you an example. When I arrived in the winter there was still a bit of a war going on in Israel, and one Friday I saw how the GH the Admor Shlita was very occupied. 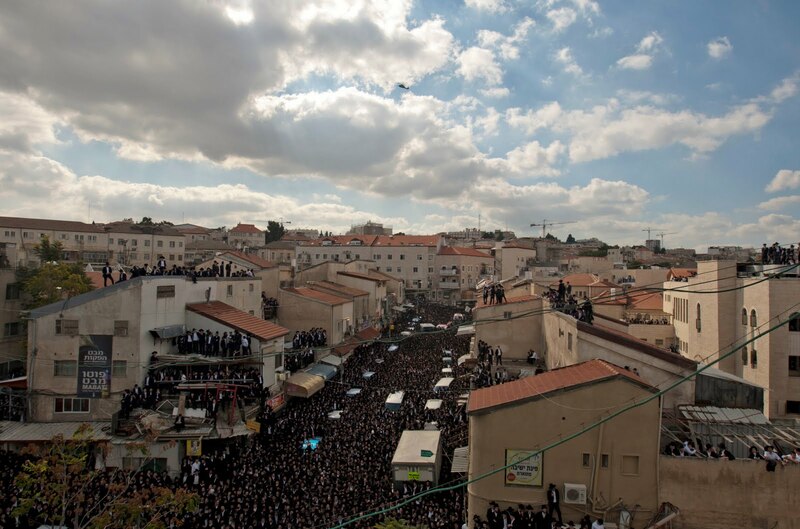 The Rebbetzin was not there yet [i.e. 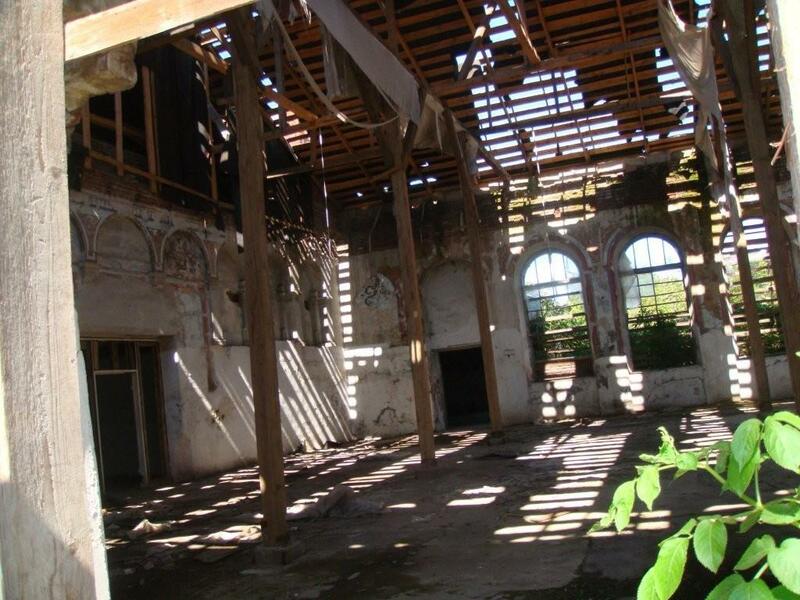 they were not yet married - ET] and it took a long time till the kindling of the candles, till the GH the Admor Shlita entered to light the candles without having had anything to drink, not even some coffee. Only after candle lighting did he drink something and then davened tefilas Shacharis, because in Israel they light the candles according to the Jerusalem calculations which works out at 40 minutes prior to sunset and therefore he was still able to put on Tefilin. 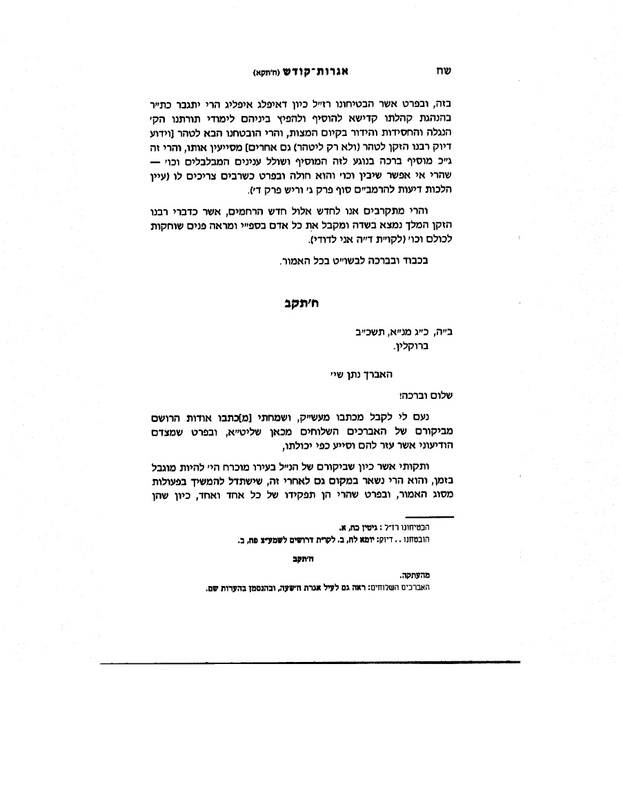 We are of course troubled by the GH the Admor Shlita's conduct. 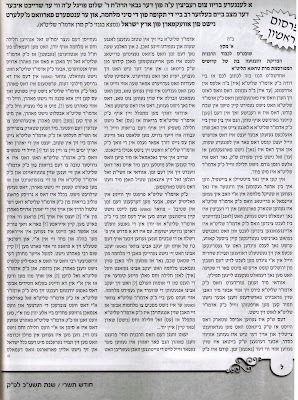 But we have tried different approaches and not always do we succeed because the GH the Admor Shlita will not be swayed. 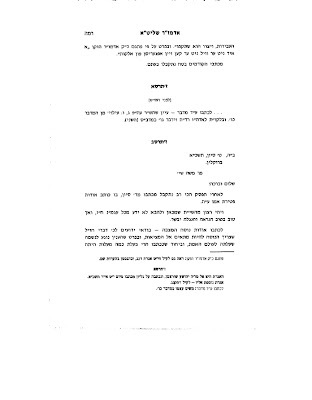 Now regarding the Rebbetzin's enquiry about travelling, although in previous years there was a greater danger because according to newspaper reports Nasser ym"sh was planning to start a war, G-d forbid, on the Jews and at that time there were requests from abroad, from Antwerp, that the GH the Admor Shlita should get himself a passport and leave the country for Antwerp, nevertheless the GH the Admor Shlita would not agree although there is some divided opinion on the matter. Firstly, traveling is no simple matter for the GH the Admor Shlita and it may be as dangerous as not traveling, because how would he travel? 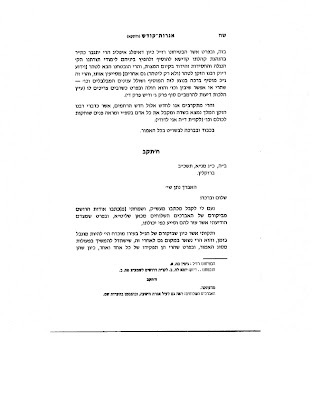 The GH the Admor Shlita absolutely refuses to travel with an airplane and it is impossible to travel by sea, especially due to changing weather conditions. We are very pleased that with G-d's help the GH the Admor Shlita walks about the house, that now at this age, may he live many days, he should be mobile. 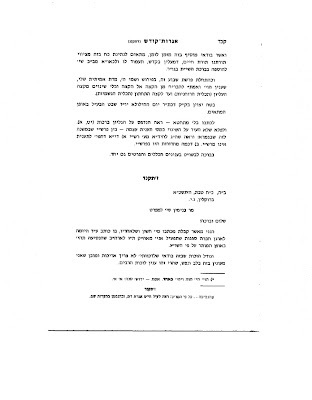 The GH the Admor Shlita's attendants are of great benefit to the GH the Admor Shlita's well being, as they are used to him and he is used to them and should he travel they would be prevented by law from accompanying him. Generally, leaving Israel is very questionable due to the GH the Admor Shlita's health and the stress of travelling, especially at this age. Then the question arises, where does one travel to. To Europe? A few weeks ago and perhaps even now there was more panic and fear in Europe than there is in Israel. 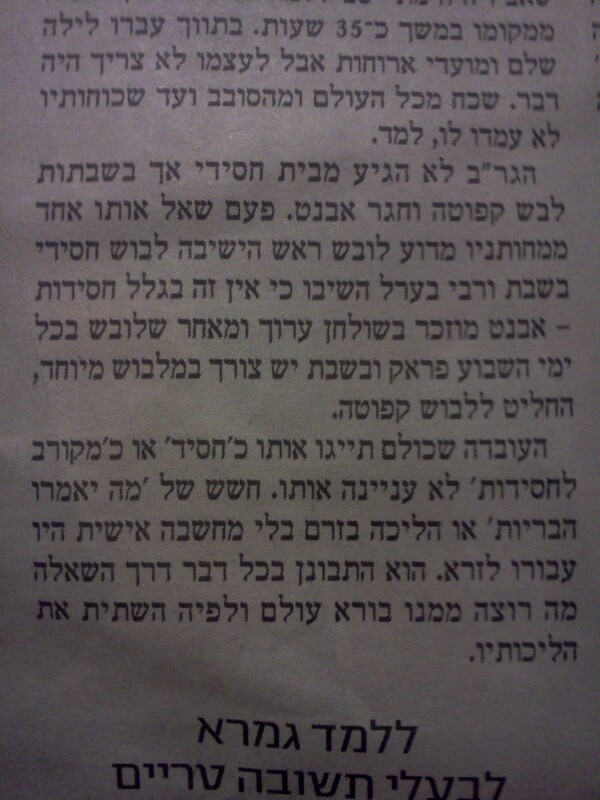 Then there is the issue that how does one travel if no other Rebbe is travelling. 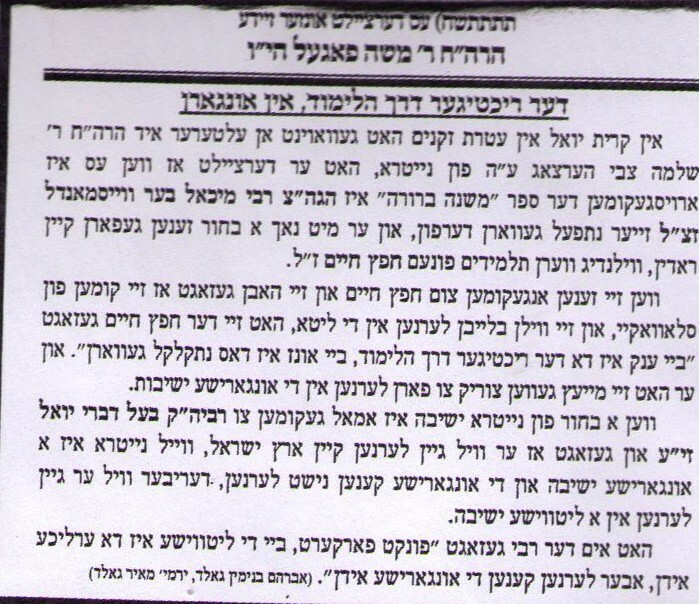 For instance, your mechuten the Vizhnitzer Rebbe who has a family does not intend to travel, and likewise others, so the GH the Admor Shlita should run off? One must also be aware that there are few Belzer chasidim in Israel but nonetheless the entire Jewry look up to the GH the Admor Shlita. 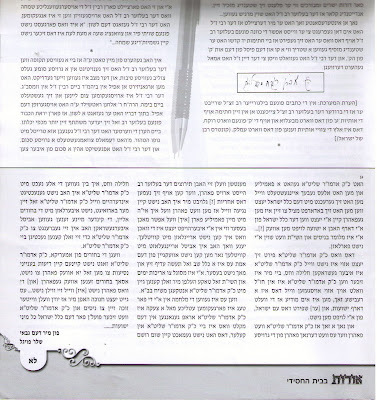 Should the GH the Admor Shlita abandon Israel it will break their hearts and cause great fear to all the Jews of Israel. It will be said that since the GH the Admor Shlita is leaving it is a sign that the outlook for Israel is, G-d forbid, not good. When he was in Poland etc. 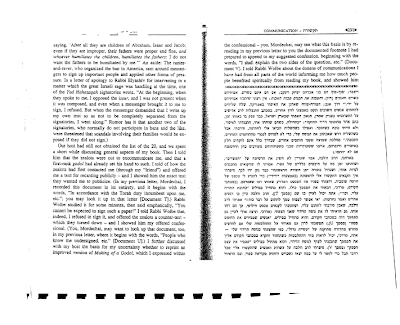 the situation of klal yisorel was always taken into account and he did not just think of himself despite that the GH the Admor Shlita had a family at the time. Alas he risked everything because klal yisroel was taken into consideration. 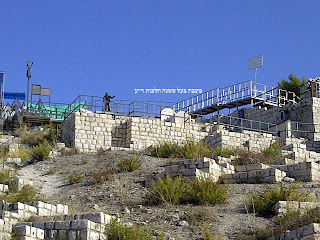 When he had to rescue himself he came to Israel so now when klal yisroel in Israel needs help will he run away...? Israel is acquainted with miracles and G-d will not forsake Israel. 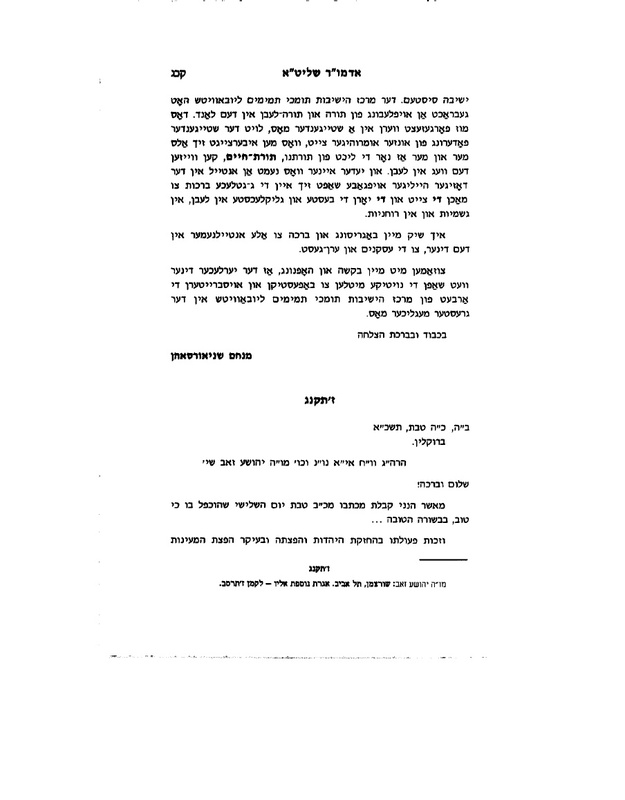 The GH the Admor Shlita's current conduct is not because he is in a state of shock, G-d forbid. I am certain that had he been abroad his conduct would have been no different because these are Rebbishe matters. He is informed that the world is in need of salvation and he feels for the nation of Israel and one does not flee from Israel. One other thing, if the GH the Admor Shlita were to travel, then whichever of the great men who might follow will have an excuse that the Belzer Rov has given orders to travel. Who can take upon himself this responsibility? Trust me, I have no interest in the matter because if he were to travel then please G-d I and my family will also travel. I might even do better than in Israel especially now that during these weeks I am unable to admit people with kvitlech. Last week I admitted a few people with kvitlech, but one cannot escape the truth of the general rule that it is preferable to remain seated and not act, sit and do not seek to improve. Israel is conducive to longevity and may G-d indeed help that we should be able to welcome the Messiah with the GH the Admor Shlita speedily in our days, amen. 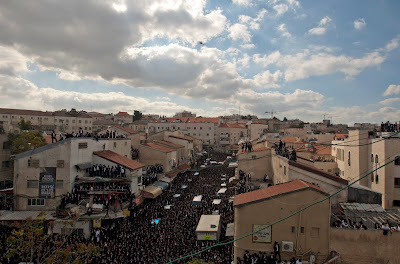 During the war in Israel there were several sirens during those few days and the GH the Admor Shlita went into the bomb shelter in the GH the Admor Shlita's basement. It made no impression on him, G-d forbid. I spent all the nights with the GH the Admor Shlita and I did not sleep at home so that the GH the Admor Shlita should be more assured and not be left alone with the bochurim. My children were slightly worried and I brought them to the GH the Admor Shlita so that they could spend the night with the GH the Admor Shlita. I chose to leave the comment as is to let you see the mood out there. Watch The Banquet Here. Note: We cannot vouch for the quality of the stream. 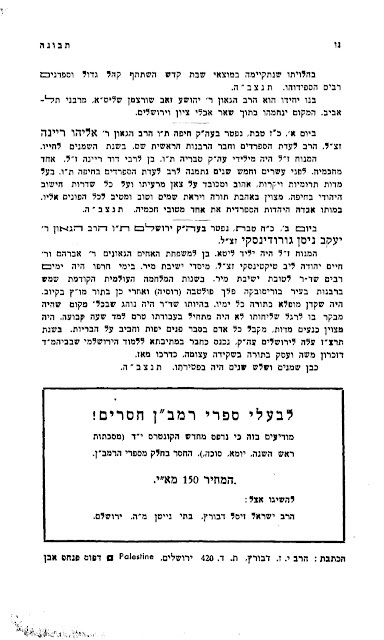 An historic letter from Reb Shulem Fogel, legendary gabbai of the previous Belzer Rov, zt"l to the "Iron Lady of New Square," Rebbetzin Traneh Twerski, o"h, wife of RYY of Skver, and mother of the current Skverrer Rebbe shlit"a. Traneh was the daughter of Reb Pinches (Pinye'le) Ostiller, HY"D, who was married to a sister of the Belzer Rov, a daughter of Reb Yisocher Dov of Belz, zt"l. This was the time of '56 Sinai Campaign and she was concerned about her uncle's well-being. It seems like she wanted him to leave Israel and travel to Europe until it all blows over. 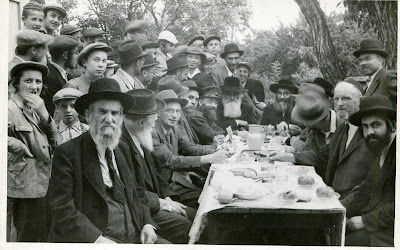 Reb Shulem writes that the Ruv's family was sacrificed in Poland during WW2 for Klal Yisroel, and that during the war the Ruv always thought about the Klal, and not about his personal well being. Yes, I know, many of you don't read Yiddish and feel left out. 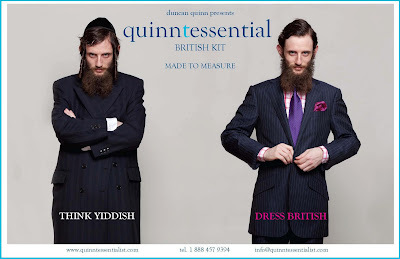 Believe me, I do it out of love, of Yiddish, that is. I bear no ill will to you non-Yiddish speakers and readers. I did give you a basic idea as to the contents of the letter, so cut me some slack, will ya? Luzer Twersky modelling for some British clothes manufacturer. Are they actually British? I cannot tell, the website they list in the pic doesn't seem to be clickable, so it's hard to glean any info from there. Luzer is a Rebbishe kind, his father is a Rebbe in Boro Park, and he decided to take a different path, a path not associated with Religious Jews, which is rare for Rebbishe kinder. Rebbishe kinder seem to be stuck in the rut that was created for them and they don't really get out much, even in a permitted way. 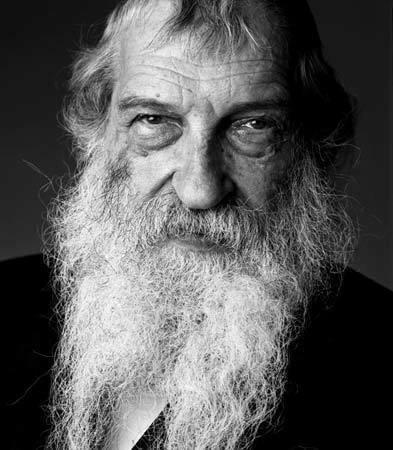 [The only other time in recent memory was Reb Nachman Yosef Twersky, who left Rachmastrivka in Yerushalayim to join the Army of Lubavitch. And boy, did he ever get it over the head! 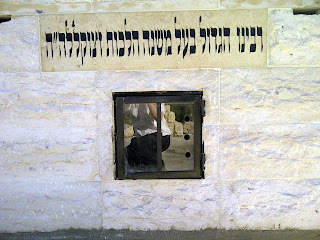 And Lubavitch too!] Luzer is no longer with us ideologically, but he keeps his beard and peyos so that he can get acting jobs that call for a beard and peyos... Those are his own words. For a long time that seemed to be wishful thinking, the agents weren't calling him, but no it seems like he made the big time! I dare say he does quite a good job here! And lest you think that I only attack non-Chabad, read this and weep! 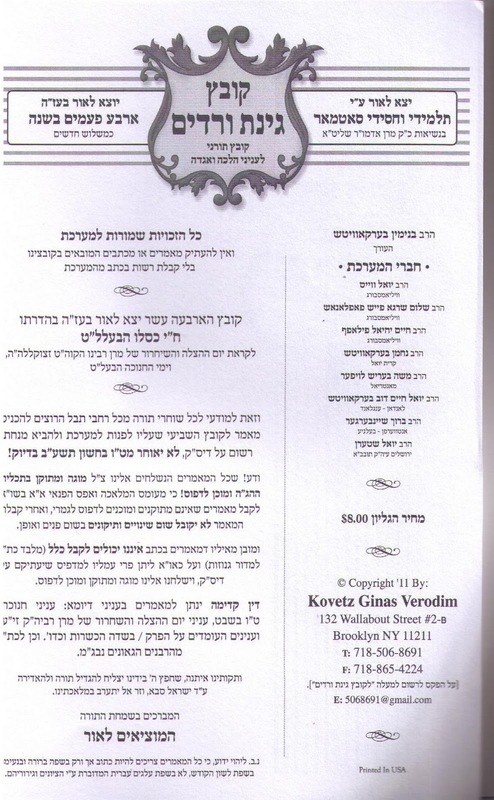 Received via e-mail: "On an August Paris afternoon, a troubled young man rang the bell of Rebbetzin Bassie Azimov. He had met her two years before in New York, but how things have changed. They were cousins but he could not recall how. He had fallen in with a hard crowd but had finally willed his way to 28 Rue de Vinaigriers. "Who are you?" 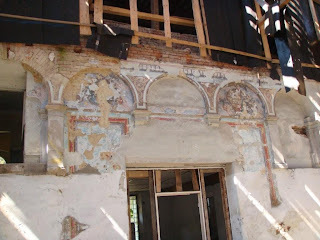 from the French window on the second floor. "Ari Brisk," was the answer. "Who are you?" she asked again, looking at me. "What happened to you?" Two minutes later she opened the front door, admonishing him while inviting him upstairs. 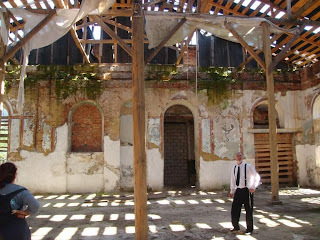 Rabbi Mulle (Shmuel) Azimov was on the phone but the harsh words did not stop. To Ari's dismay, she had drawn a bath, placed all his clothes from the dirty knapsack to wash, and was cooking a meal fit for a king- all this with harsh words, but softened by the smell of fried shnitzel. Events took a turn for the good.Years later he'd recall this parodox- it stayed with him. He is not the only one; there are hundreds, perhaps more. 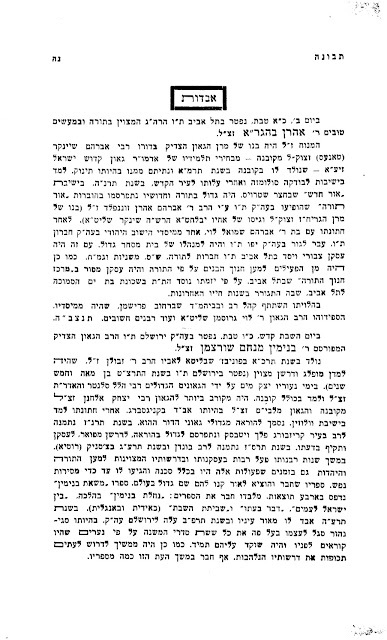 I'd say it was her total bittul to the Rebbe which allowed her to saunter from an elevated perch, and touching others, allowing chassidus to flow through her for there was nothing else.She referred to the Rebbe as "dem Rebben" not der Rebbe, implying a belonging of chosid to Rebbe. The Rebbe was familiar and available but more important was the urgency of the Rebbe's call. There was work to be done, and, arguably, no shluchim have done that work as the Azimovs. I once ate at their Shabbos table when a guest, new to traditional Judaism, began asking questions about feminism and Judaism when Bassie interrupted her with a very strong lecture about the state of women today in light of promiscuity in modern culture. I felt embarrassed for the woman; Bassie was being too strong. To my astonishment the woman became a full ba'alas tshuveh, within a few months. She was persistent and more importantly lived the Rebbe's truth in heroic fashion, all this with a life threatening illness that she harbored for years.The involvement of the Rebbe during her trying sickness, entailed daily updates and guidance. For years she ate butter and told me that when she was unable to digest food, the Rebbe had recommended butter, and it had been the only food which she had been able to digest the following years. Bassie never for a moment compromised. Perhaps therein is the secret, how one is imbued with that special spirit to be an infinite chosid of "dem Rebben." Is Areivim out of touch? You may not get to see this fine publication; it may be Monsey-area only. 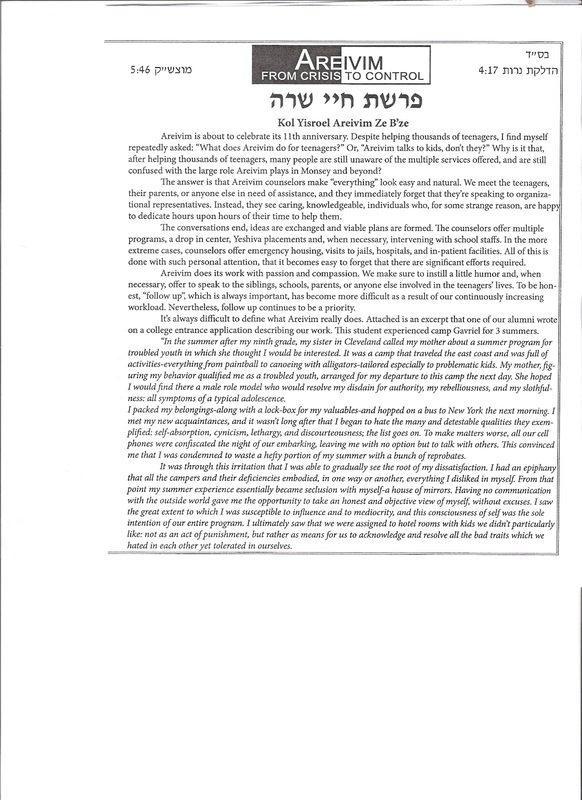 I didn't see last week's issue, where they mentioned Shlomo and Meir Kahane's Yohrtzeits, so I don't know what it was exactly that they wrote. 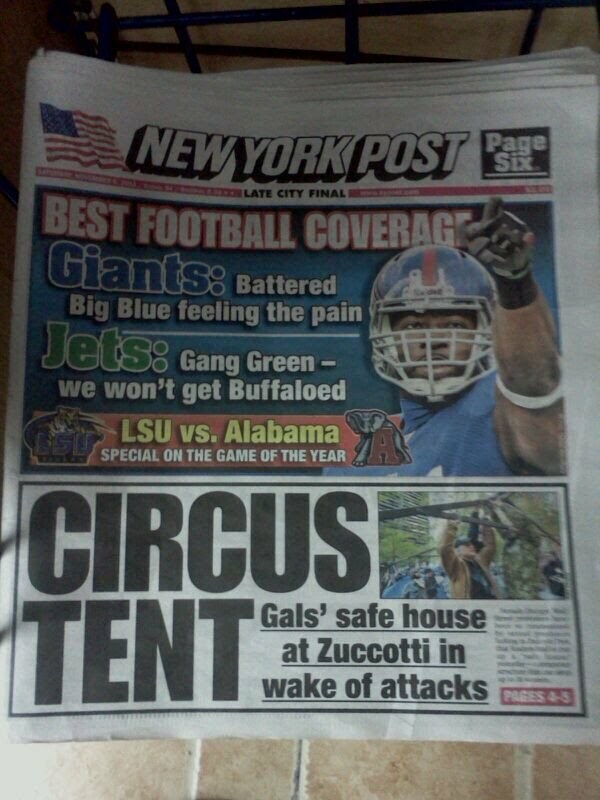 But my son ZG"Z (= zol gezunt zein) brought this to my attention. He knows by now what gets my goat, I guess. 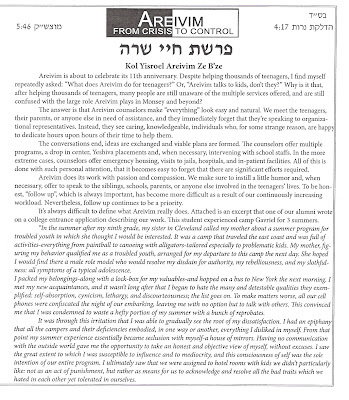 What strikes me as really weird about this is the fact that I'm sure that an organization like Areivim - "From Crisis to Control" - is not a very rigid operation when it comes to saving at-risk youth. Meaning that they'll allow things like watching sports and maybe even non-Jewish music at their centers/functions - if they have any. I'm sure that Carlebach is just fine too. Now I know that allowing it doesn't make it right, but being that Shlomo was active in saving at-risk and lost youth you'd think that they would cut him some slack. Also, if you teach kids that people like SC and Kahane are not "true gedolim" will that make them wanna come and be helped by an organization like yours? Aren't you then like the Mesivta Rebbi or principal that he so dislikes?? That's all besides for the fact that Shlomo and Kahane resonate very strong with OTD and AR youth. I assume that there were complaints about them, but complaints can be handled in several different ways. Writing a childish retraction like the one here is just that, childish. The Cover. Notice how they only use Rabbeinu Tam's zman for מוצש"ק. "?? ?וואו זענען זיי ווייטער אזוי פארקרומט געווארען"
In 5704 Reb Berel's zeide was niftar, The Mechaber of משאות בנימין, that isand the periodical "התבונה" had an article about him. It seems like his elter zeide was niftar only 5 years prior to that, and was 105 (!) at the time of his passing. Based on what they say here we see that from his father's side Reb Berel came from a very choshuve Litvishe family. 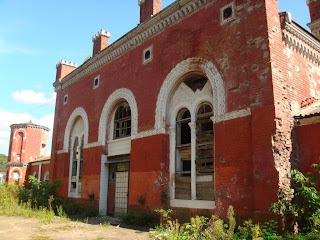 He was a talmid of Volozhin and a choshuve Rov in Russia. 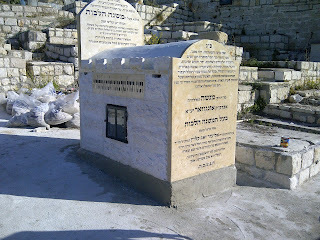 Der zeide was a mekurev of the Aderes, Reb Yitzchok Elchonon and many others. No real mention of Chassidim. Which goes to show you that they really didn't do their homework; they could have shut up those darn Lubabs once and for all by showing all these bonafide Litvaks in his yichus briv! But when it comes to Reb Berel's father they have little to say. All they say is that he's a Rov in Tel Aviv. 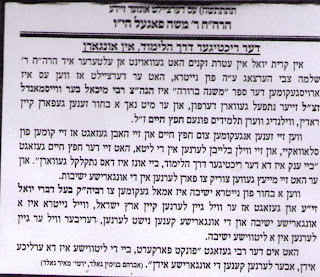 They could've said that he was a Talmid of the Slabodka Yeshiva, which was the line of the week when it came to all the newspapers...Now, I admit the information is choppy, but I have heard from his (distant, somewhat) relatives that Reb Berel's father was a Rov who sat on all the Agudas Chabad meetings in Tel Aviv, and was considered a "Chabad Rov." I will not jump the gun here and say that it was an intentional omission by HaTvunah, even though they were a publication for Mussarnikes, maybe they were limited in space and could only write about the niftar. 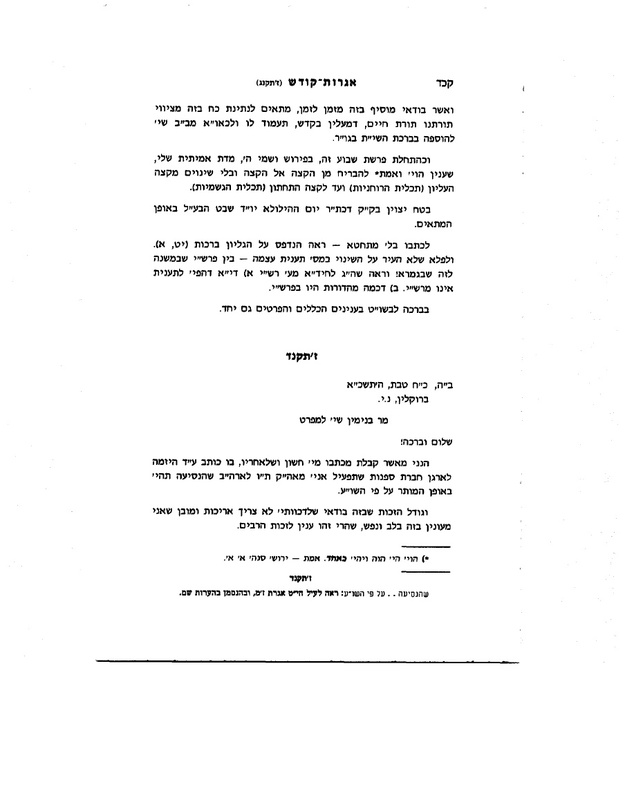 The letters from the Rebbe prove what? I'm not quite sure. They prove that the Rebbe had a place in his life, whatever that means, and that he considered himself enough a Chabadnik to be in contact with the Rebbe. That much he learned while living in Nevel, I guess. 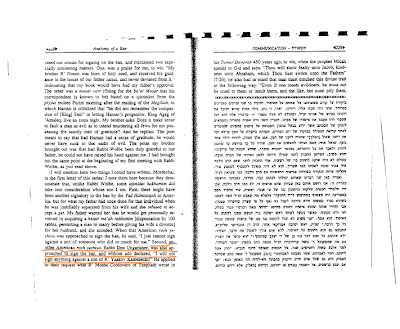 I'm not assuming that Reb Berel had a strong connection because of his mother's family, who were out and out Lubavitcher Chassidim, but I know he did! That doesn't necessarily translate into a Lubavitcher obituary, I realize that. But we are discussing his yichus, and it was a part of his life. We've seen here in comments and in e-mails that I've received that he would attend farbrengens, daven in Lubavitch in London when visiting family there, as well as a story that he had with the Frierdige Rebbe when he asked about whether or not he should do his first shidduch... 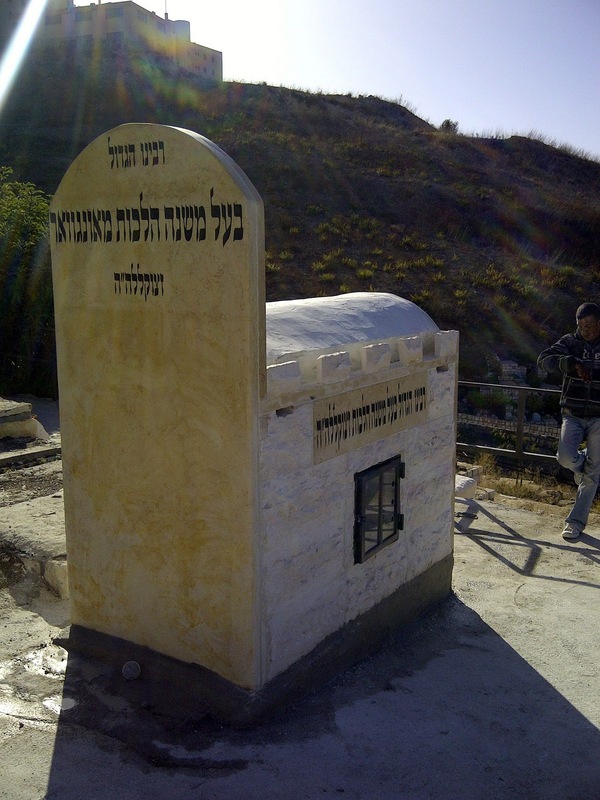 Ultimately wee see that Reb Berel was lost between two worlds - meaning that despite his gadlus b'torah he never ended up "making it" like some people in the Olam HaYeshivos who didn't posess half his kishronos and knowledge. Some of you have told me privately that because of the kepeydes of either RAK or RYH, both of whom have it in for him... May his neshomoh have an aliya. This magazine clip was sent to us by a relative of Reb Berel Shvartzman. 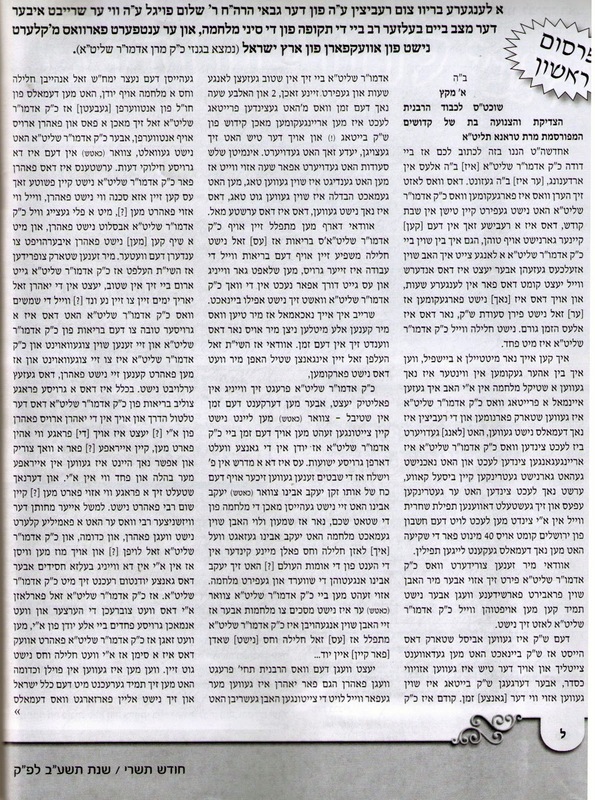 I was quite surprised to see this appear in the בקהילה, which has a Chabadnik editor-in-chief, Binyomin Lipkin. It would not bother anyone if they say that he came from a Chassidic home but took another path after seeing the great ameilus baTorah in Chevron/Lakewood, but why would you deny his background and heritage? Especially after telling us that he was born in Nevel, a Lubavitcher town like no other! This is being an Umfarginer to the 10th power! Many classics as well as rarities available there for your listening pleasure. Please try and refrain from "blaming" Lubavitch here for any of what you see as his indiscretions. 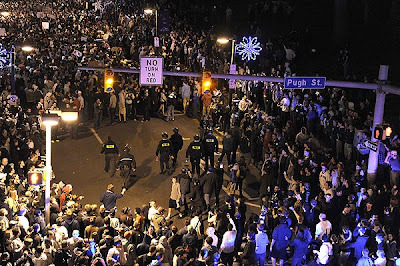 However, I cannot keep you from doing it בין הסדרים in Philly or Stamford or Passaic, or at your Shabbos table on a long Friday night. You can do there as you wish. You can also discuss how R' Aron cried when he heard לולי תורתך, or how he was supposed to become the Reb'Kiveyger of that generation," and other such Yeshivishe hock. What's more interesting to note is how his music and he himself have become so popular among the Chassidishe Oylam, especially those who have a hard time conforming to the mainstream Chassidishe/Hungarian norms of today. במרומי צפת sits the resting place of the one who made my bris, cut my hair and made me peyos, leined my Bar Mitzvah aliya, and who kissed me on di shteren after I said my Maamar at my leChaim/vort. (It was a maamar ד"ה שיר המעלות הנה מה טוב ומה נעים שבת אחים גם יחד.) 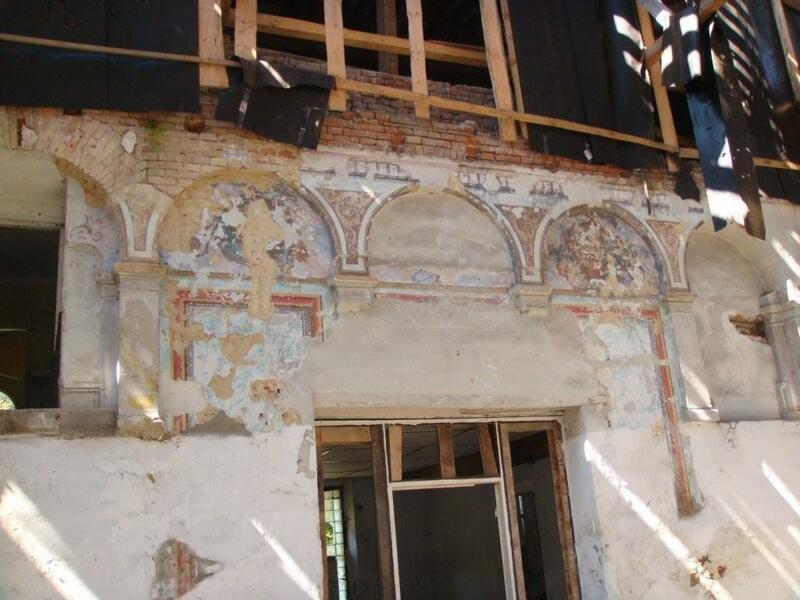 I believe these are the first published pictures of the newly erected Matzeivoh. When I went with my father zg"z to invite him to my wedding - nisht heint gedacht - he apologized that he could not attend since it took place overseas and he was not feeling well at the time. 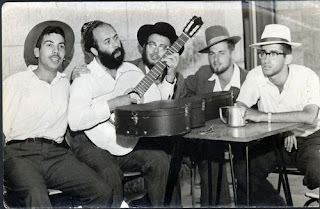 He also has a very strong connection to my shver zg"z and his father, z'l, and he was overjoyed to see me join that family. [Needless to say I have much to say about Hagaon HaRav Reb Menashe Klein, zt"l, but I have yet to find the time to do it properly. 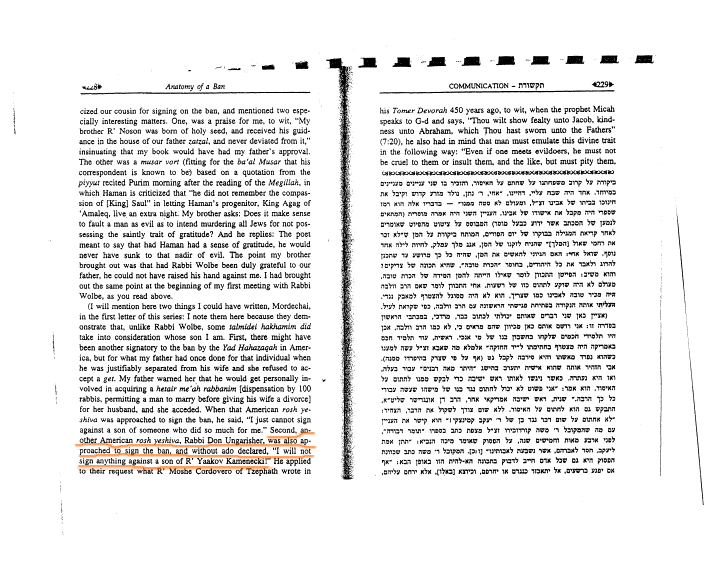 There's his connection to Lubavitch, how he was treated in the general Olam HaTorah, as well as Rabbonim, Roshei Yeshivos and Tzaddikim.] 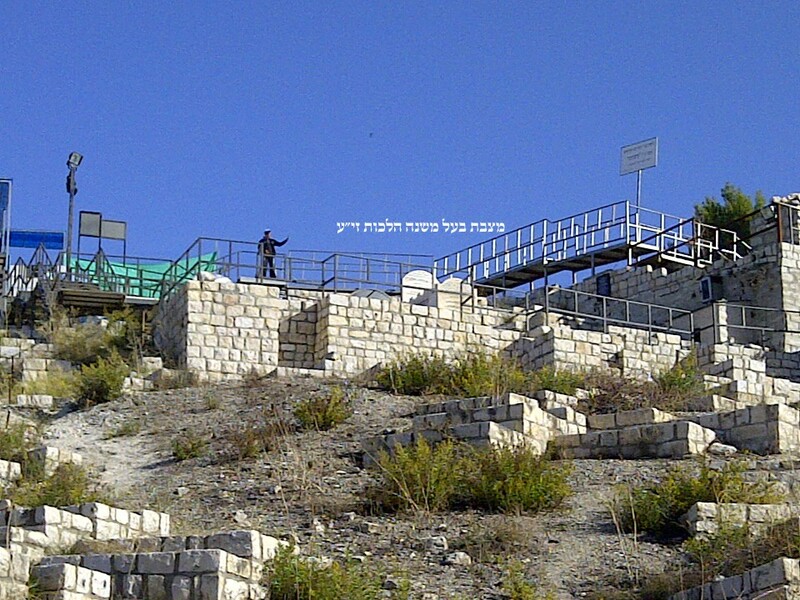 RMK asked that he be buried there, next to the resting place of HaRav Amrom Chasida, zt"l, whose tziyun he restored. 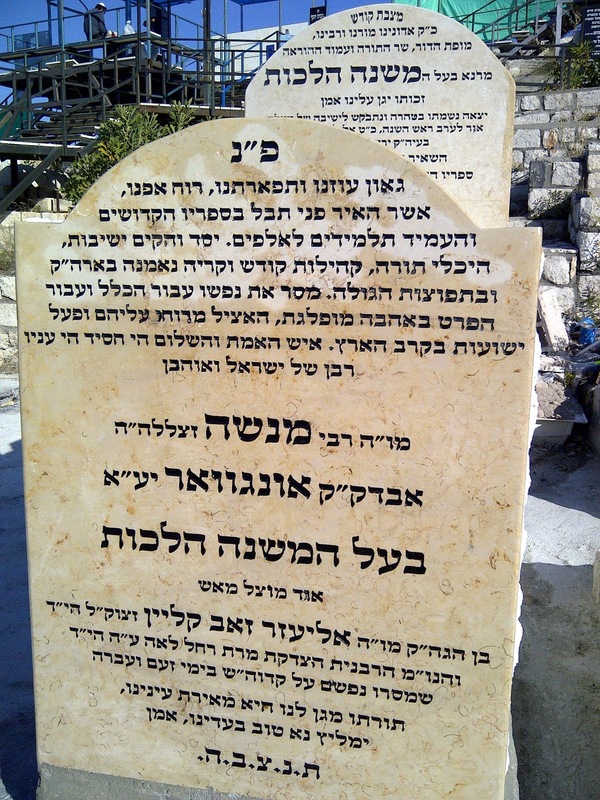 His wife, the Rebbetzin nee' Frankel, was a descendant of his, as well as the Beis Shearim, lineage that the Rov adopted as his own...I hope to find the time to write. It'll have to be done in parts, and even if I do start I hope I'll be able to carry it through. 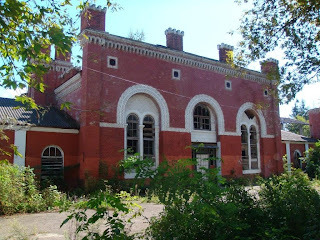 another angle of the matzeivoh from the back. 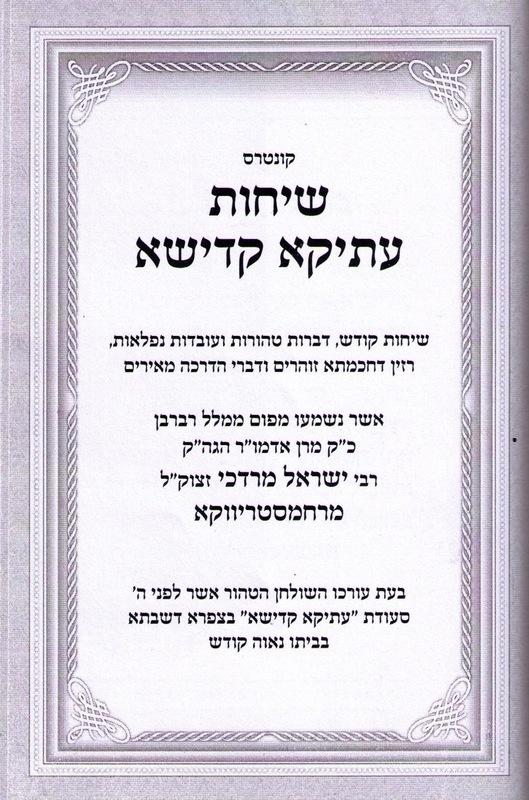 A new sefer/kuntres that transcribes the talk of the late Rachmistrivka Rebbe of Yerushalayim, Reb Yisroel Mordche Twersky, zt"l. Some of what is discussed here, namely the idea that the Rachmistrivka Rebbe would give 6 hour shiurim in Nigleh seem a bit far-fetched. Also, I've yet to have it confirmed that the Lubavitcher Rebbe would attend these shiurim, but anything is possible. We learn new things about the Rebbe every day. 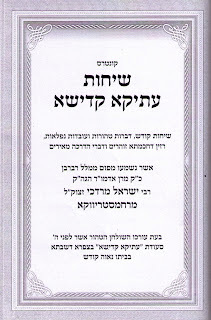 The fact that they give Reb Meir Berlin the title "הגאון" tells us alot. I guess they didn't get the memo that RMB was אאוט. Why, all he got in "הרב מבריסק" was ",הרב" just like Rav Kook and Menachem Porush... and he was the Rov's uncle! Reb Noochem'tshe Rachmistrivker was known as mamesh a fartzeitisher Rebbe, and the Frierdige Rebbe would be mazkir himself (and his family) by him, which he didn't do with many other Rebbes. I think Reb Aron Belzer was the other Rebbe he would send a kvittel to. Reb Menachem Nachum of Trisk-Brisk; Much of what is brought down here I've seen elsewhere, so it seems like הרבנים לבית בריסק had derech eretz for Rebbes, at least those וואס האבען געקענט לערנען. Pictured: Shoproner Rov - Reb Shimon Yisroel Posen (r, with Rabbinic, flat Beaver Hat) & and (hidden) Rav Yisroel וועלץ (l) ראב"ד דקה"י בודאפעסט, and later in Yerushalayim. Center, with uniform - Rabbi Shenkelevsky from the Joint; Standing First on the left - Reb Shemtov Meyer - Mechutin to the Tosher Rebbe, father of the Lizhensker Rebbe of Monsey.. The Two young men Standing in the center wearing caps are children of the Shoproner Rov. 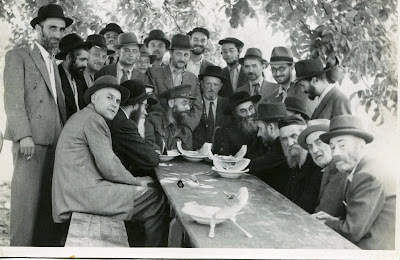 We need to identify the man with the Platchiker Biber hat next to Rav Woltz. 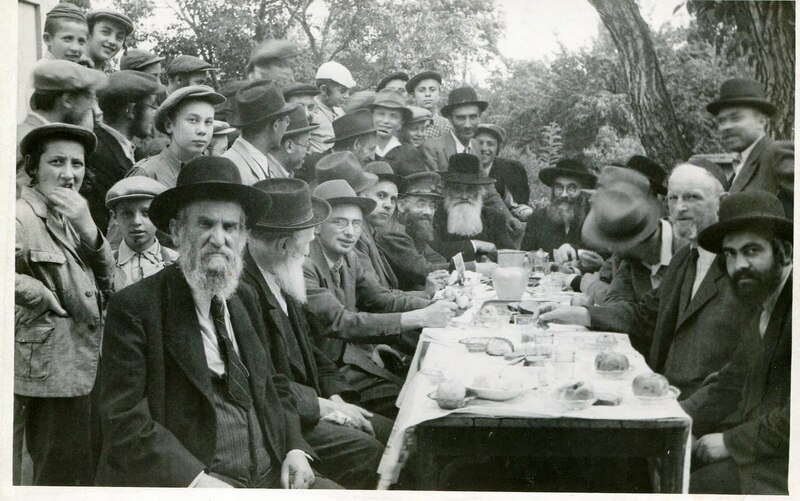 Seated right is the Shoproner Rov, left is Rav Yisroel Woltz of Budapest, zt"l. Child standing First to the left - Reb Avraham Chaim Spitzer. Seated second to the left is Reb Avraham Steinmetz, Sitting 2nd from the right is Reb Asher Zelig Steinmetz. Man sitting First left is also seen in the First picture, albeit without his hat. If you see other people in the picture that you can name, please do so in the comments. I should put a watermark on these never-before-seen pictures, but who has time? and why should I keep them from stealing it? 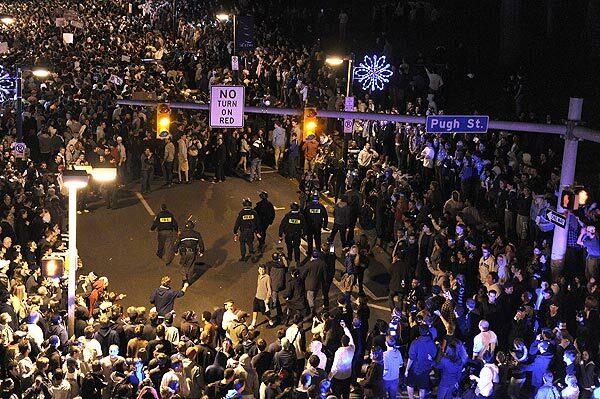 let them enjoy. 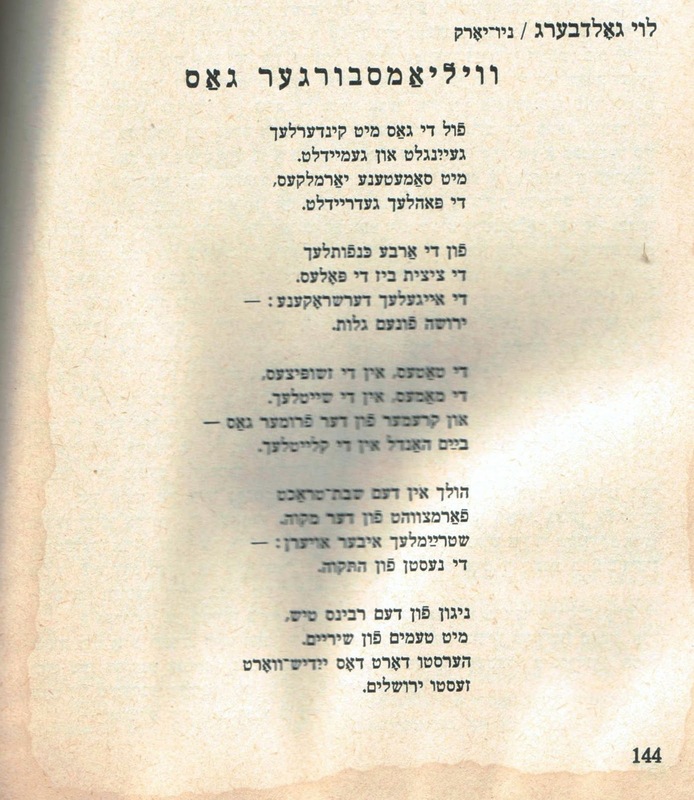 Aaron Zeitlin's masterpiece accompanied by vintage footage of pre-WW2 Warsaw, which is no more... Aaron was the son of Hillel Zeitlin, HaYaD, and came to America in March of 1939. The poem was penned in 1945. 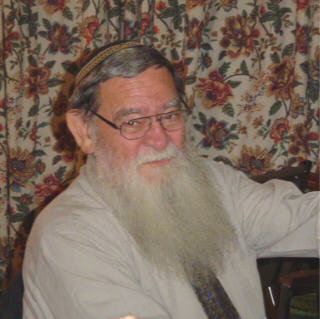 Yeshiva World Calls him the "father of Rav Yaakov Eliezer Shlita, who is the eldest grandson of Hagoan Rav Aaron Kotler ZATZAL, and is presently the Rosh Yeshiva of Lakewood East in Yerushalayim..." Berel Shvartzman was from Nevel. Yes, that Nevel. I was told that he was boki in Tanya and Likutei Torah. 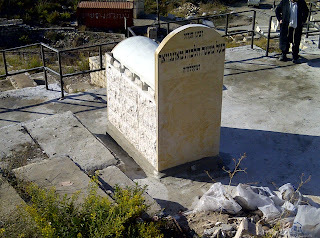 His mother was HaYitzchaki, a cousin to the famed Reb Zalman Moshe of Nevel. His family left the USSR during the 30s and Berel learned in Eitz Chaim, IIRC. [ I'm told now that he was a Chevroner.] 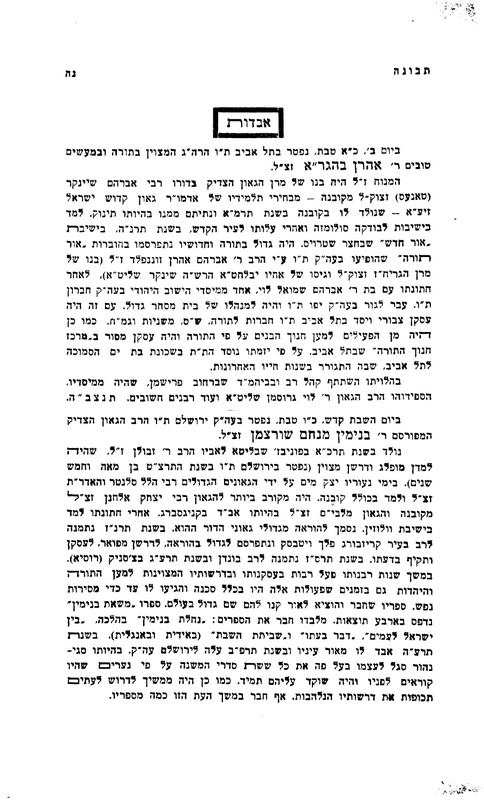 Once during a visit by RAK to Israel he gave a shiur in his shver's (RebIsserZalmanMeltzer) Yeshiva Chevroner Yeshivah and Berel was not impressed by the shiur... And told him so... So RAK took him to America and married him off to his daughter. That marriage ended rather unfavorably, but his kids did manage to get pedigree that was more to their liking than a Neveler balagoleh... כאטש אז יעדער חסיד וואלט אנדערש געזאגט. 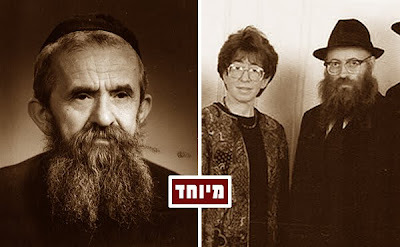 The frum webistes seem to not want to recognize that he had a wife and life after the divorce, and several children too... Reb Berel was married to a sister of Rav Uri Chountal's of Yerres, France, wife, who passed away a month ago. If only they could package the baloney like Alle Processing does... They would be rich! Rich, I tell ya! Imagine if Lubavitch would say this, that the Litvishe Derech HaLimud, i.e. Reb Chaim Brisker and all other Litvishe Roshei Yeshiva, was wrong, and the only real Torah learned was in Russia! But the Satmorim get away with everything. 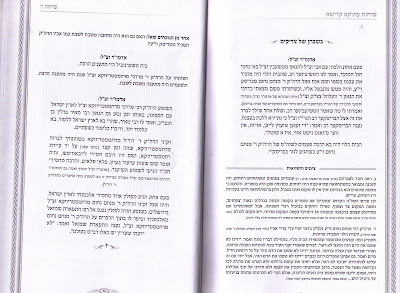 The fact that they decided to go to Lita to acquire the derech haLimud because of a Halochoh Sefer(!) 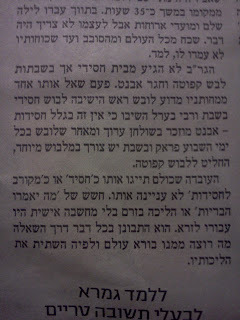 that was written decades before, no matter how "Lomdish" the Biur Halochoh is, Does that make sense to anyone out there? Breslov - not for boys only! The only difference between him and the SR, whom he hopes to imitate, is that the SR had thousands of potential children waiting to enroll in his schools. All they had to do was to be born... Roth has his work cut out for him if he wishes to have that many kids learn Sefer HaMidos by heart. Attached are pictures of the current state of the Ruzhiner/Sadigerrer Hoyf in סאדיגורא/Chernowitz, Bukovina, Ukraine. Apparently it has become a "crack house." Woe is to the eyes that see this, and woe is to the blogger whose hands have to type up this post. How did this happen? 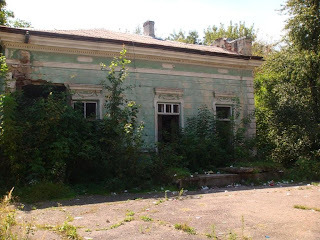 I definitely remember seeing just a few years ago how the Sadigerrer Rebbe came to Sadigora for a Chanukas HaBayis, and that it had been either bought from or returned by the Government and renovated.It was around 3 Cheshvan, the Yohrtzeit of the Heiliker Ruzhiner, and it was attended by many chassidim from around the world, including Lubavitcher shluchim from the Ukraine. 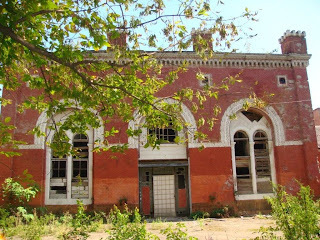 It seems like it hasn't been used since then and this is the result of the lack of use. 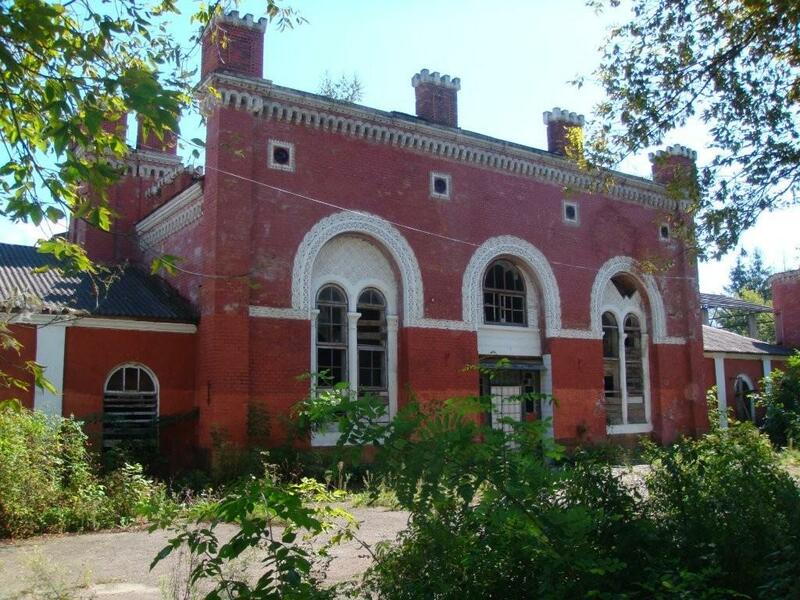 I was thinking that they probably should've leased the building to the local Chabad Shliach in Chernowitz, which Sadigora is part of. Like Karlin being part of Pinsk. That way everybody would be happy, especially the Heiliker Ruzhiner, upon seeing that Yiddishkeit lives in his hometown and in his palace. Rabbi Glitzenshtein is a fine young man who has accomplished much there, and recently dedicated a shul that he received from the Government. Maybe he could've done the same for the kloyz! 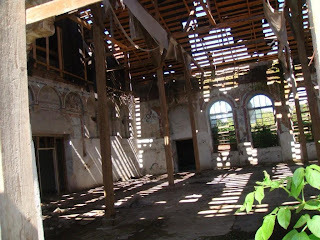 I understand that the same has happened in places like Skvira, Ukraine, where they received the shul from the Government, but due to lack of use the place falls into total disarray. Its majesty all but gone!